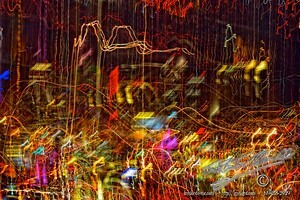 Abstract of Downtown San Diego, by night. Sometimes, “You cannot see the forest because of the trees.” Meaning that you are too close to the small details of the larger subject that the small details obscure the big picture. When someone is telling you that you are too close to something to see it clearly, then the time is here for you to back away from the subject and look at the subject from a distance, gain a new perspective, open your eyes to the new vision, get out of the rut. This image is a rut changing new perspective vision of San Diego. Also, sometimes fuzzy logic is better than a clear vision. This entry was posted in Building Exteriors, Cityscape, Painterly, Purchasable - As Art Prints. Bookmark the permalink.